Tearing Through the Week at TCMF! Westbank Jazz Ensemble, with Todd Sloan on piccolo! Austin — The Twelfth Annual Texas Community Music Festival continues Wednesday evening with a program uniquely American and entirely TCMF! The evening kicks off at 5:30 with the Americana sounds of Thursday Night Jeffersons. At 6:45, the stage will come alive with the Austin Banjo Club, making their 12th appearance at TCMF. 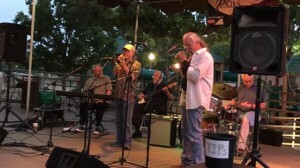 Chaparral Dixielanders, one of the few groups that have played all 13 Texas Community Music Festival (remember, we had TWO festivals in year 8), will bring it home again from 8-9. Wonderful weather and outstanding performances have been the hallmark of TCMF XII so far this week, as music lovers delighted to Monday performances by the Stray Bullets and Poor Yorick and swinging sets on Tuesday by the Skylarks, Armadillo Swing Band and Westbank Jazz Ensemble, featuring our own Todd Sloan on jazz piccolo! Texas Community Music Festival will continue throughout the week, with weeknight performances beginning at 5:30pm and weekends beginning at 10:45. Performances end at 9pm each night. So join us!